Body Attack Appetite Reducer Fem is an excellent preparation reducing the appetite based on natural fiber (glucomannan) derived from the root of konjac plant (Amorphophallus konjac). Ideally suited as a support for people who want to lose weight or have an excessive appetite. In addition, the product may contribute to lowering the level of cholesterol, triglycerides, and glucose in the blood. The preparation has been enriched with vitamin B12 and calcium, which have a positive effect on the process of weight reduction. Glucomannan – a multi-sugar classified as soluble fiber, which is obtained from the root of konjac plant, often called a devil’s tongue. It is built of a simple polysaccharide chain, which consists of β-D-glucose and β-D-mannose units. Glucomannan has hypolipidemic and hypoglycemic effects and has a beneficial effect on the intestinal microflora. It has been shown that this ingredient can be successfully used as an aid in slimming. The water-soluble fiber has strong water-absorbing properties in the gastrointestinal tract. The fiber contained in konjac – glucomannan – has the highest hygroscopic properties of all types of dietary fiber. It is estimated that it can absorb an amount of water equivalent to fifty times its weight. Increased water absorption make the contents contained in the digestive tract to swell. Stretching the stomach walls is a clear signal to the body that enough food has been eaten, and thus glucomannan suppresses hunger and quickly provides a feeling of fullness. Taking the supplement 30-60 minutes before the planned meal helps to reduce the number of calories consumed and also slightly prolongs the digestion time. This, in turn, contributes to a reduction in postprandial blood glucose, which is very often elevated in overweight people. Too large amount of glucose in the blood can lead to the development of type 2 diabetes, insulin resistance, as well as neuropathy or cardiovascular disease. Glucomannan reduces the intestinal absorption of cholesterol, thus contributing to the reduction of its blood level. Excess cholesterol may accumulate in the walls of the arterial vessels and thus impede the circulation of blood. As with glucose, the prolonged time of digestion reduces the levels of triglycerides, which are also a determinant of cardiovascular diseases. According to some studies, glucomannan may be also helpful in the treatment of constipation, because, like other forms of fiber, it supports normal intestinal peristalsis. Through increasing the so-called peristalsis, glucomannan facilitates the passage of food through the subsequent parts of the digestive system and prevents accumulation of deposits. Vitamin B12 participates in the production of digestive enzymes and regulates the intestinal microflora, promoting the development of beneficial bacteria and destroying pathogenic bacteria. Calcium positively affects the oxidation of fatty acids, and its increased level supports the process of slimming. In addition, calcium may be important in reducing the risk of colon cancer. 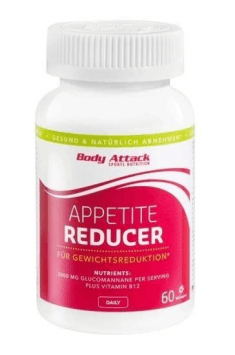 In summary, Body Attack Appetite Reducer is a dietary supplement based on natural ingredients that increase the feeling of satiety and improve digestion, as to facilitate slimming. The glucomannan contained in the preparation is the most hygroscopic type of fiber that increases its volume in the digestive system. Internal pressure on the stomach walls signalizes about the intake of a large amount of food and thus reduces appetite, promoting slimming and loss of fat. In addition, the preparation positively affects the postprandial level of glucose, triglycerides, and cholesterol, contributing to the improvement of metabolic health. Take two capsules three times a day with plenty of water (300 ml) approximately 30 minutes before main meals. To ensure an optimal effect of the supplement, remember to drink a lot of water (400-600ml) following the administration of the supplement. In order to reduce cholesterol levels, it is recommended to take 4 g of glucomannan in a divided dose – 2 capsules 3 times a day, preferably before the main meals. Glucomannan is generally well tolerated and safe, however, some people may develop side effects including flatulence or diarrhea. The product should be stored in a cool and dry place. Use quickly after opening and avoid high temperatures and exposure to light. Hydroxypropyl methylcellulose (Capsule shell), Separating agent (Calcium carbonate), Colouring (Titanium dioxide). Dietary supplement improving skin, hair and nail condition. A complex nutrient for muscle mass building. Contains 6 protein fractions. Increases anabolism.